Sizes ranging from 400,000 to 1,600,000 BTU. Indirect Burners provide more safety and efficiency. Simple controls that are designed for easy expansion and adaptation to changing requirements. Nyle has built tons of heat treating kilns for firewood. Nyle units are sold as turn-key systems including chambers, or customers select just the equipment they need for installation in customer supplied chambers. Nyle developed a control system that is easy to run and to expand. Since the beginning of the requirement to heat treat lumber, the rules and requirements have often changed and no doubt will change again. 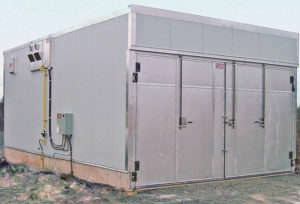 Nyle systems are designed for easy expansion and adaptation to changing requirements. The systems are developed in-house and our famous support is at hand from our offices here in Maine. The chambers that Nyle builds are rugged and built for long and efficient life. They are designed for fast loading and unloading. Wider chambers load and unload faster than long thin chambers so Nyle’s prefabricated kilns are designed to be 19’ wide by 30’ deep. The extra width also dramatically improves airflow and shortens the processing time. 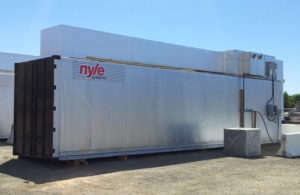 Nyle uses high insulation values to reduce operating costs. Nyle is flexible and can use hot water heat, steam heat, direct fired gas, indirect fired gas and electric heat. Whatever is best suited to your specific operation can be provided by Nyle and will be the most current technology. If the customer chooses to build or supply their own chamber, Nyle can provide detailed drawings. Nyle has converted old milk coolers, trailer truck bodies, shipping containers, rooms in existing buildings, and we have built free-standing constructions of everything from wood frame to concrete to steel or aluminum. Contact a Nyle Representative for more details.